X-Wing Revisited - Finished model RED 5. The X-Wing Revisited Model Kit is a replica of the original filming models used for the Star Wars films. 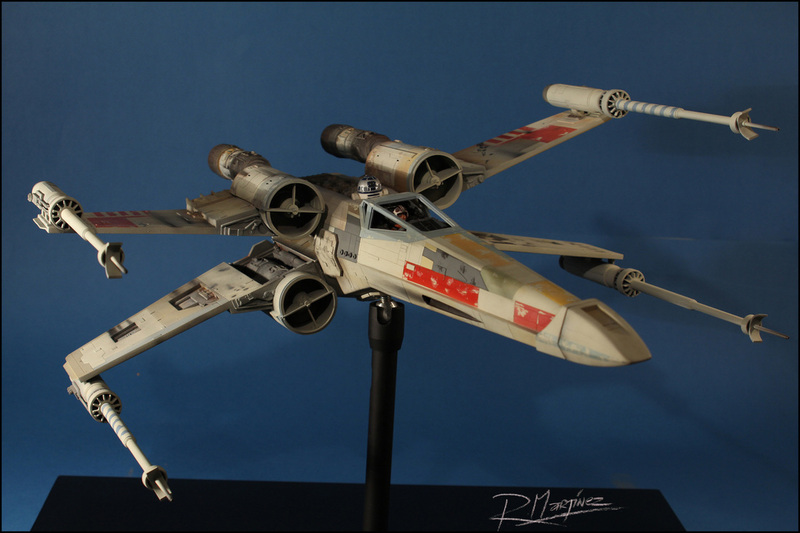 Of the same dimensions of the original model the Revisited X-Wing counts with the functional and detail level that elevates the model kit to the filming model category. The characteristics I refer to are the big scale size (1/24th), the high level of detail and, an internal aluminum armature that allows wing articulation and the possibility to attach the model to a stand from 4 different points for filming or exhibition. 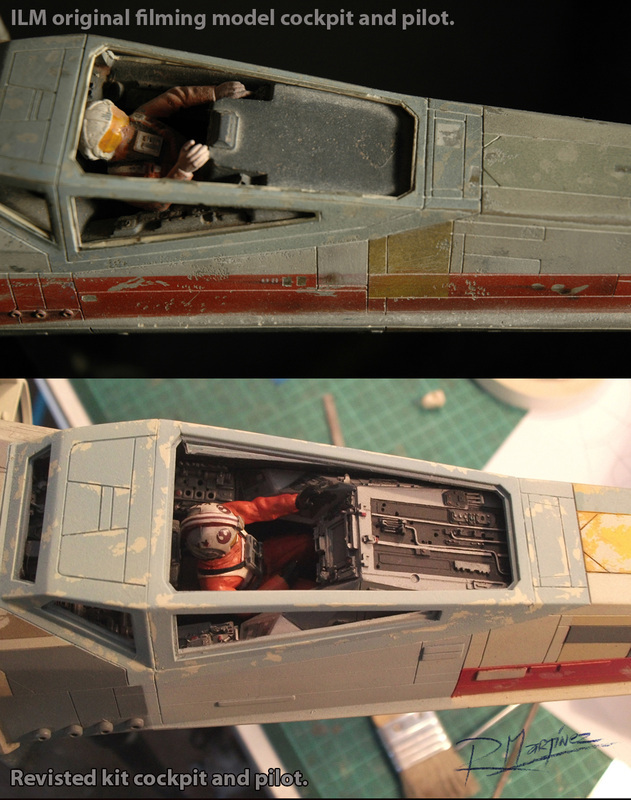 The original models have an interior cockpit and pilot very different from the one we are used to see on the film. The huge 1/1 scale props built of the X-Wing in London for principal photography have a very detailed and particular cockpit, with a very intricate design for the main control Panel. That’s the main reason why I tried to replicate to control Panel of the 1/1 scale X-Wing, with all the intricate angles that compose it and as similar in detail as possible. 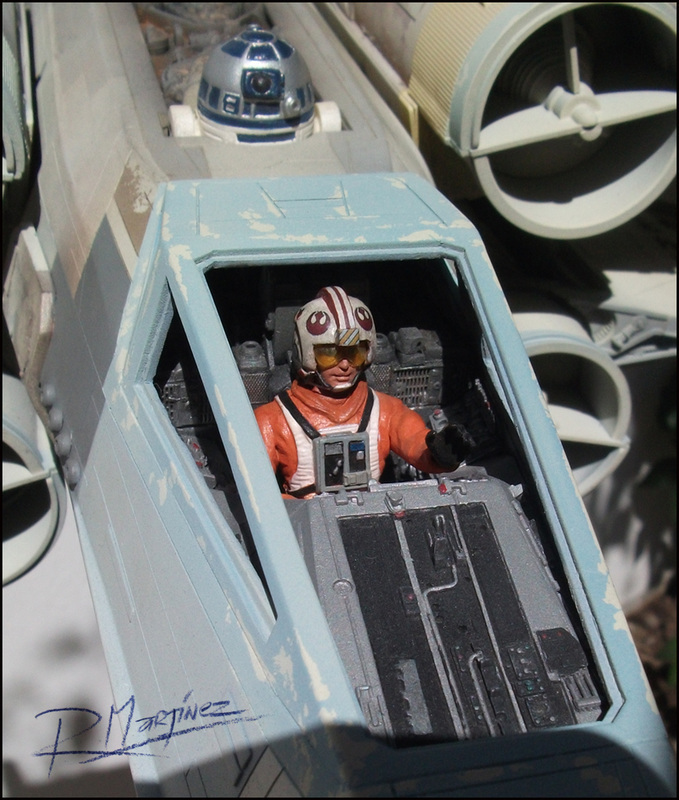 I also sculpted a 1/24th scale X-Wing pilot to try to match the suit used by the actors in the film, including a set of decals for the helmet’s markings and vacuum formed goggles no bigger than 7 mm wide. 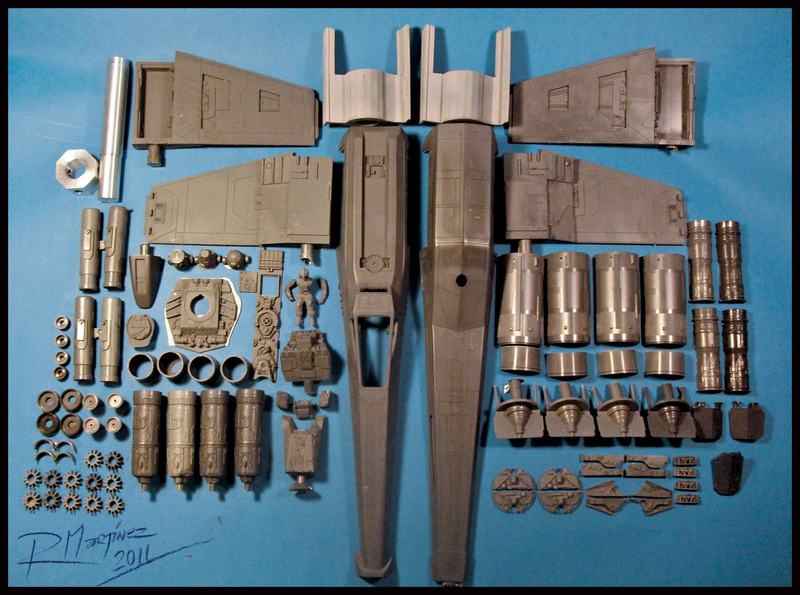 Just as the original models, the X-Wing Revisited is cast with Resin. The high quality resin used to cast the kit has excellent physical resistance properties and is very easy to work with as it responds very well to sanding and polishing, allowing a very smooth finish. It also responds excellently to Cyanoacrylate glue. 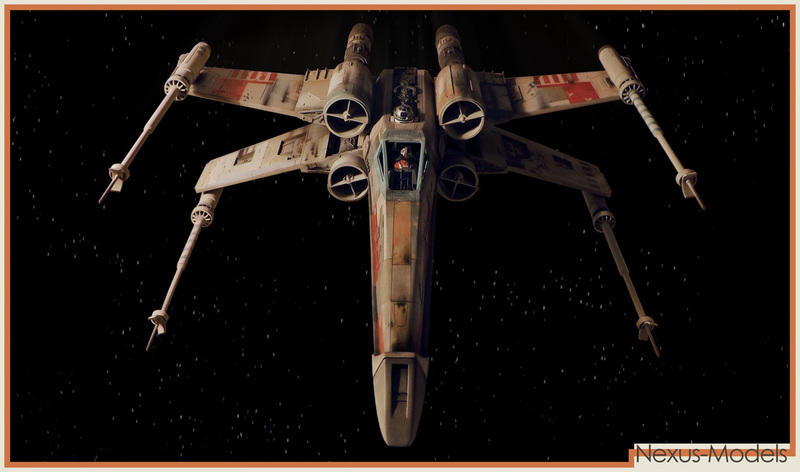 The Revisited X-Wing owes its name to a special modification I developed for it and that differentiates it from the original filming models: the cockpit interior control panels, and pilot figure. 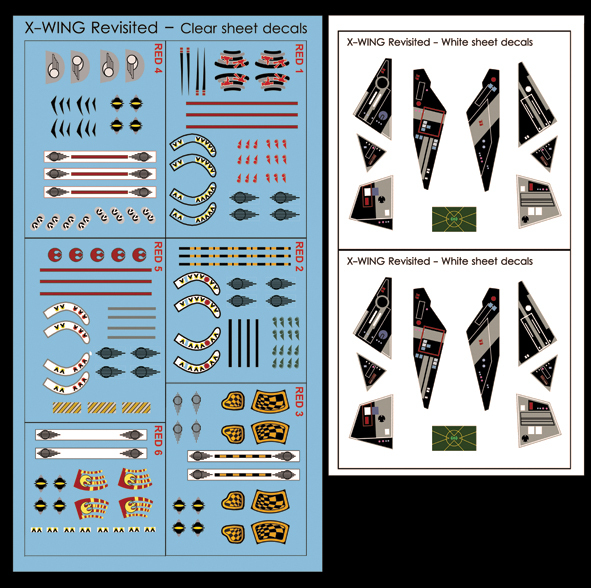 The X-Wing Revisited decal set allows you to accurately represent the helmets of Red Leader, Red 2, Red 3, Red 4, Red 5 and Red 6 plus control panel details. Helmet and Control Panel Decal Sets.